Active 60’s year old woman was frustrated with appearing worn and tired. She was an active, dynamic woman who enjoyed working out and traveling and simply felt her looks were inconsistent with how she felt. She did not want to be “invisible” and “irrelevant” any longer. 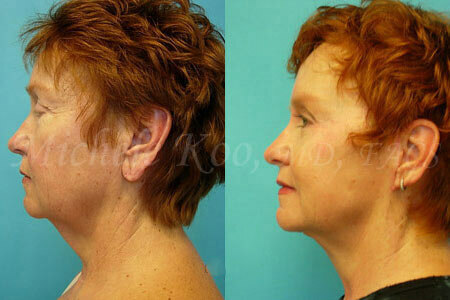 She asked Dr Koo for her suggestions for an overall facial rejuvenation. 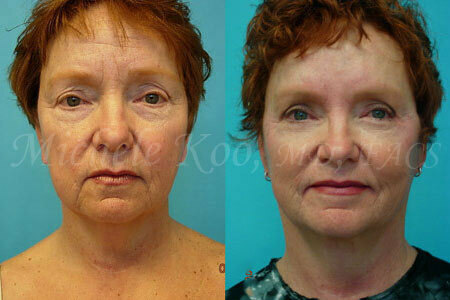 Dr Koo performed a lower facelift addressing primarily the jawline, marionette lines, naso-labial folds, and the “turkey neck.” She also performed an upper and lower eyelid blepharoplasty (eye lift) to remove the “tired” look. The eyes are what every one sees first and Dr Koo felt that creating clean crisp eyelid creases and taking away the eyelid “bags” and filling in the sunken areas below the eye area would significantly remove the signs of “aging.” Dr Koo believes in creating the natural better you, not a surgical you.